I don’t think I mentioned this before but I am using SD cards with my D800 exclusively. Main reasoning for not using CF cards is to minimize number of gadgets I need to have and travel with. Since most laptops released in the last few years have SD card readers it becomes a big selling point for using only SD cards. If you decide to use CF cards then you will have to buy a CF card reader and carry it around when traveling. Besides, CF cards are quite more expensive than SD cards. The only downside of this approach is that you use only one memory bank instead of two. 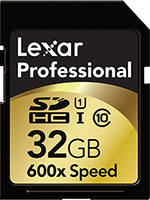 I am using Lexar cards now, while I used SanDisk before. I’ve got 3 Lexar 32 GB 600x speed cards (pictured here) and so far I have not experience any slowdowns in camera when shooting.